With a population of well over 200,000, Swindon is by far the largest town in Wiltshire; housing over a third of its inhabitants. The arrival of the Great Western Railway in 1842 facilitated the rapid expansion of this once small market town, creating one of the fastest growing towns in Europe. Today, this modern sprawling, industrial metropolis, has very little of interest for the tourist, apart from the STEAM Museum and the McArthurGlen Designer Outlet; both housed in the old GWR locomotive works in the centre of town. If your looking for more historic sites then it is best to visit Swindon Old Town, which is set on a hill to the south of the city centre. The area was known as 'High Swindon' in Edwardian times and 'Nob Hill' during the late Victorian era. Here you will find the Museum & Art Gallery and several fine 18th/19th century properties, constructed from the local pale limestone. Archeological digs around this elevated area have unearthed evidence of settlements dating back to the Stone Age, Bronze Age, Roman and Saxon eras. Details of which can be discovered in the town Museum. The core of the old town is situated around Wood Street, Newport Street and the High Street, where the site of the original medieval marketplace can be found. Overlooking the old market square (now a car park), stands the original Town Hall and Corn Exchange (1852-54). Sadly appearing in a very dilapidated state. 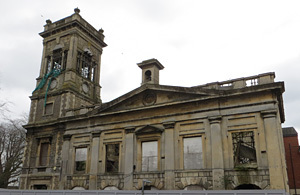 Happily, there are plans afoot to renovate this grand, Grade II listed, Ashlar stone edifice, to its former glory. A number of old coaching inns can be found along the High Street, the oldest of which is The Bell Inn, parts of which claim to date back to 1515. The 16th-c Goddard Arms (formerly the Crown), was renamed so by Thomas Goddard; the owner of a manor house that once stood the grounds to the east of the High Street. Swindon manor estate, known as The Lawn, is now a public park. It is a wide expanse of trees and greenery that provides panoramic views over Swindon. The manor house was demolished in 1952 and a sunken garden and brick built folly is now all that remains. The new town area, to the north of Swindon, developed in relation to the site of Brunel's GWR locomotive depot and repair centre. The GWR works opened in 1843 and closed in 1986. During this time, the site developed into the largest locomotive works in the world, covering some 320 acres, and employing up to 12,000 workers. Employees were housed in a purpose built village of stone built terraced cottages (see top image). The cottages are still occupied today are are managed and maintained by the local authorities. One cottage (34 Faringdon Road) is kept as a museum, refurnished in the style of a typical foreman's home of the late 1800s. The Railway Cottage Museum is operated by volunteers, so only opens on rare occasions. 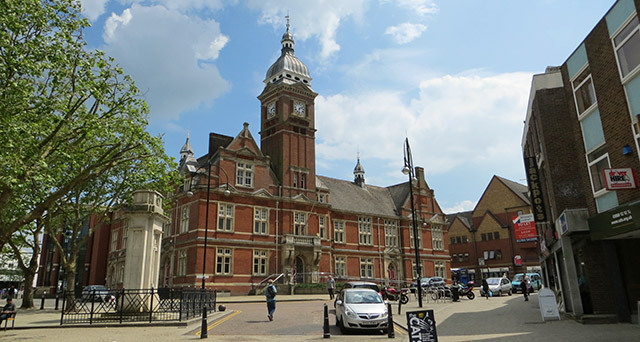 Swindon's Victorian Town Hall (circa 1891) is located at the foot of Old Town hill, sited in a convenient location between the old and new town areas. Its modern counterpart, Swindon Civic Offices, is now located between Beckhampton Street and Euclid Street, in town centre. Coate Water is a former reservoir now a bird sanctuary, centred around a large lake to the southeastern edge of Swindon. The park contains a number of surfaced pathways and trails, a nature reserve, visitor centre, splash park, play area and a cafe. 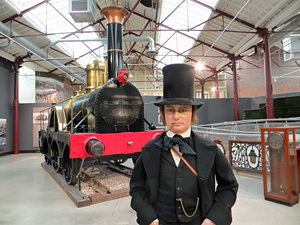 The STEAM museum opened in 1962, with displays of locomotives, wagons, photographs, drawings and other GWR memorabilia. Visitors can operate an interactive signal box and a steam train simulator. There is also a reconstructed station platform and recreations of some of the old manufacturing workshops. In its heyday the GWR maintained over 9000 miles of track between London, Bristol, Penzance, Fishguard and Liverpool, serviced by 3600 locomotives and 9000 passenger coaches. Locomotives on display include a 1922 Castle class (with underside viewing pit), the City class City of Truro (1903), a Hawksworth Pannier tank engine, plus a full size replica of Brunel's wide gauge, North Star (shown above). The first passenger train to run from Paddington to Maidenhead (1837–1871). This large country park in the outskirts of Swindon once belonged to the St John family (the Viscounts Bolingbroke). It was purchased in 1943 by the Swindon Borough Council, who have since restored it and opened it to the public. The mansion is a two story mid 18th-c stone structure, 11 bays wide, with pyramid roof pillions. Its core dates back to medieval times but was largely rebuilt around 1740. Next to the house can be found the little 14th-c church of Lydiard Tregoze. Entry to the grounds is free (parking charges apply). The house is currently not open to the public but the walled garden can be visited for a small fee. The humble farm house in which the naturalist and writer Richard Jeffries a was born in 1848. It exhibits of many early editions of his work and personal items. Also on display are the writings of Alfred Williams the railway poet. Location: Marlborough Road, Coate Swindon, SN3 6AA. Parking at Coate Water. The McArthurGlen designer outlet is a modern shopping centre built within the old GWR locomotive factory in the city centre. It hosts a wide range of top branded shops, selling designer clothes, accessories, cosmetics, household and technology goods, all at competitive prices. Much of the original overhead gantry work and some of the old machinery and cranes have been left in-situ, for posterity and general interest. The image above shows a 'Walking Crane' built by GWR in 1923. 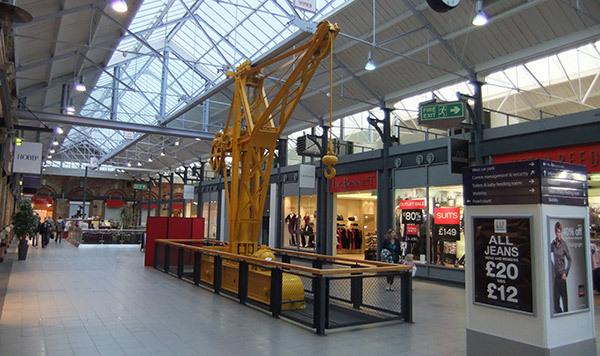 This type of crane was common around the works and could lift up to 4 tons. It was so named because it could be moved along on special rails. The Art Gallery displays the work of several modern artists, including works by L.S. Lowry, Henry More, Ben Nicholson, Vanessa Bell and Lucian Freud, Graham Sutherland and John Nash. 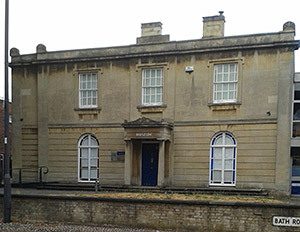 The adjoining museum, in Apsley House (1820), expounds on the history of Swindon from its rich archeological past to its industrial heyday. Displays include archaeological and geological finds, local pottery, Egyptology remains and items of natural history. The main collection was founded in the 1920s by the former GWR worker and businessman Charles Gore.